So the Grammys were Sunday night. I chose to watch them over the Pro Bowl. I probably should have been interested in the TEN Chiefs players involved in the game. Rumor has it that Tony Gonzalez’s last catch of his career was from the Chiefs’ Alex Smith. Pretty poetic stuff right there. But no, I was watching the Grammys, which are usually a January highlight for me. And this year’s did not disappoint. Daft Punk won big and performed, so basically anything else that took place was icing. Here are a few takeaways from what I saw on Sunday night. Daft Punk teams up with Pharrell, Nile Rogers from Chic and Stevie Wonder for a Get Lucky/Another Star mash-up (with a little “Freak Out” and “Harder, Better, Faster, Stronger” in there too). So amazing. I really hope the robots are working on a 2015 version of Alive 2007. One of my first takeaways from Random Access Memories was that parts of it seemed like a set-up for something bigger. Much like parts of Homework did. This time they managed to weave the whole record together in a way that hides the pieces within the whole, but I fully anticipate an epic mash-up album sometime in the next couple years. All that to say, I’ll be listening to Stevie Wonder constantly this week. I might even dabble in Journey Through the Secret Life of Plants (which i found on vinyl for $3, and couldn’t help myself). I should also note that Pharrell’s hat was ridiculous and Stevie came off a little creepy early on. But the whole thing seemed to mesh once Guy & Tom showed up in those robot suits that looked nothing like Stormtroopers. More like Dr. Evil, really. I continue to be perplexed by country music. First of all, I don’t even know what the genre means anymore. You’re telling me that Willie Nelson, Taylor Swift, Rascal Flatts, recent John Mayer, Blake Shelton, Garth Brooks, Keith Urban and Kasey Musgraves (whoever that is?) are all in the same genre? The way I’ve heard country music defined in the past is that it is all about storytelling. And I can respect that. But when the story is the same in all the songs – mostly goofy cliches and quips about trucks and whiskey and dirt and parent-child relationships – it all runs together into one lame story that I’ve heard a million times. Plus, it just sounds terrible. You’re telling me that girl Kasey Musgraves had the best country album this year? What, did no one else release anything? She wouldn’t even make it past the battle rounds on The Voice, no matter how liquored up Blake Shelton gets. The country performances happen, tons of people go nuts in person and on twitter. Martina McBride comes out and mentions how amazing that performance was, and I’m like…it was? I don’t understand. There is some country music that I love – Garth Brooks is awesome, John Mayer’s new album is great. I even understand the draw of the Dixie Chicks and Rascall Flatts and other bands I find obnoxious. That stuff makes sense, but it’s just not for me. Usually I leave those performances perplexed and searching for answers. Just doesn’t make sense. Paul McCartney is one of my favorite people ever. Did you guys see him snapping his fingers and dancing around to the Daft Punk performance? Has anyone made a GIF of that yet? I don’t know how to do it, otherwise I would. Watch the performance video I linked up above and jump to 3:32. Hilarious. Paul always seems like he’s having a blast, but doesn’t have a care in the world. His reunion performance with Ringo was hilarious in that light – Ringo was thrilled to be there, and Paul seemed like it was just another day at the office. It’s whatever. Just one of the most influential musicians ever. Anyway, in his nonchalance, he took home 5 Grammys last night. UPDATE: I have found it. Look at all those snaps. I love you, Internet. How did Random Access Memories win Album of the Year? I mean, I loved the album. It was one of my favorites of this past year, and I haven’t done any serious thought as to which albums trump it, but it certainly didn’t seem like it should have won Album of the Year. It’s not even Daft Punk’s best album (Discovery), and it’s not even the best album ever called RAM (what’s up Paul McCartney? ), but somehow it beat out Sara Bareilles, Taylor Swift, Kendrick Lamar and MacLemore/Ryan Lewis. Oh, that’s why it won. Not much competition there. No offense to the other four – especially to Sara B., who I think it phenomenal – but they’re just not going to win that category. If Drake or Jay-Z or Beyonce or Kanye or some indie band, then Daft Punk may have been in trouble. But those four don’t have the clout to take home the top spot. Maybe Taylor Swift was the biggest competition, but it just didn’t feel right. Just my opinion. 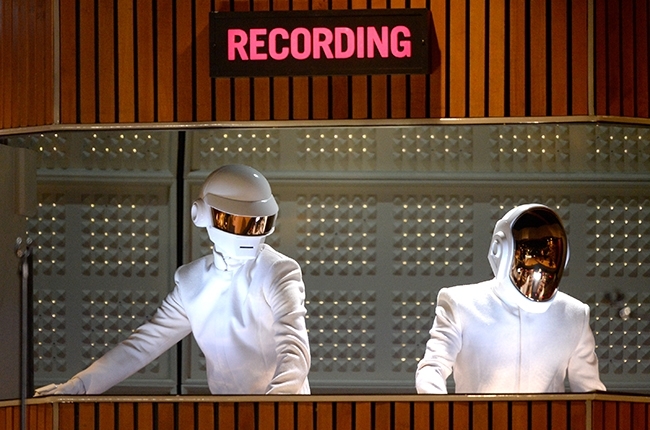 Even still, it’s surprising to see a French robot electronica duo step into the Grammys and clean up. It’s unlike anything we’ve ever seen at the Grammys, I think. It sorta felt like they were being rewarded for past greatness. I mean, RAM was pretty good, but it wasn’t THAT good. I think they really rode the wave of one giant hit – Get Lucky – and that was enough to take home both Record and Album of the Year. The only other song that has even made it to the public is Doing it Right…which is terrible. Felt like a weird category this year. 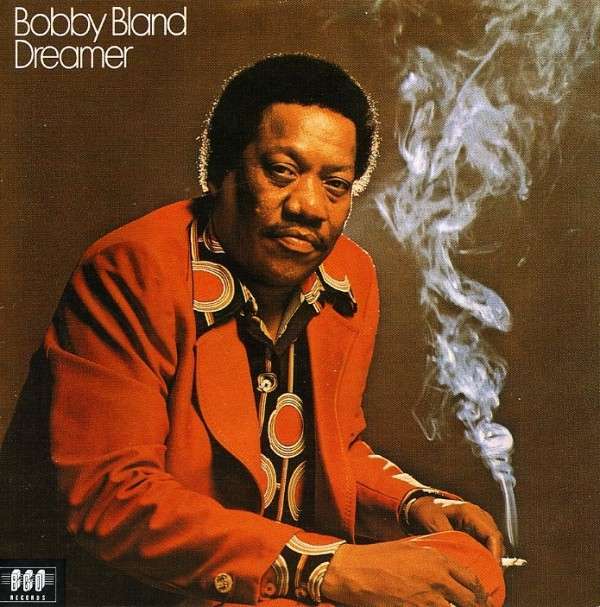 Today, Bobby “Blue” Bland is probably best recognized for being sampled by Kanye on my favorite track off Jay-Z’s The Blueprint, “Heart of the City (Ain’t No Love)“. The audio is also huge in car commercials. The album the the sampled track comes off of is called Dreamer, and it is wonderful. It’s one of my favorite albums ever. He’s looking at you, in this gorgeous shirt, with the smoke from his cigarette swirling all around him. Bobby does this crazy thing with his voice that makes it sound like one of those fish-shaped percussion instruments that you played in music class in elementary school. It’s called a “guiro”, and his voice somehow breaks into it randomly and makes this bizarre vibrato/loogie hocking sounds that, if i’m honest, disgusts me just a little bit. But it’s so fascinating and unlike anything I’ve ever heard, I still have to give him props for it. Anyway. When the Grammys was running through it’s “who died this year” montage, his name was the biggest one to jump out to me. I didn’t know he had passed away. Maybe I’ll have to put on Dreamer whenever I’ve had enough of Journey Through the Secret Life of Plants. And lastly, Jamie Foxx is the worst. 2. he hit on Beyonce. Way to go Jay. Take the high road and save the day. Just a few thoughts. I have more, but I set a 30 minute limit on writing this post. So that will have to do.